Kohl | A Savings WOW! 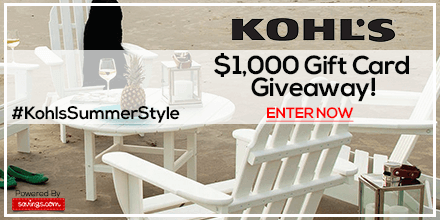 Savings.com is kicking off Memorial Day Weekend with a $1,000 Kohl’s gift card giveaway for #KohlsSummerStyle! Twenty (20) winners will receive a $50 gift card to Kohl’s! Enter your email address on the form at the top of the page at Savings.com, check “I confirm I am a US resident aged 18 or over,” and click “Submit” to enter!